Today I got the results for the RHCSA EX200 exam which I took yesterday and passed with full marks, I received a score of 300/300 with the passing score being 210. This is just a quick review about the materials I used and how I studied to pass the exam, I hope that this guide will help you study! I will not be discussing any of the contents that were within the exam, if you’re interested in what is covered have a look at the exam objective page here. Update November 2015: Our Red Hat Certified Engineer (RHCE EX300) 7 exam study guide is now available! I’ve taken a break from the Microsoft world since earning my MCSA 2012 in December last year – the time of my last blog post here. I started studying for the Cisco Certified Network Associate (CCNA) for something different however towards the end of my study for that my work was able to send me on the RHCSA Rapid Track Course with Exam (RH200) which is something I’d asked if I could do. After a while I was given approval for it so put the Cisco study on hold and got straight into Red Hat. As a system administrator that deals primarily with Linux I was keen to get some Linux based certification as prior to the RHCSA I had 5 different Microsoft certifications which might give people the wrong impression about my skills. The video courses were all great, it’s always good to watch someone do something before you try to do it yourself in my opinion as this enables you to better understand what’s actually going on. Personally I liked the LinuxCBT series the best however it was also the longest at 40 hours, though I skipped some of the videos that were about topics that I knew were not covered in the RHCSA exam, the exam objectives page here lists the topics that are covered. The two books were very useful as well, I started my study first with the RHCSA/RHCE study guide reading chapters 1-9 which cover the RHCSA, chapters 10-17 are focused on the RHCE so I’ll go back to that some time in the future. This book was good as per the name it was directed at the subjects that are in the RHCSA exam, however I liked the real world skills for red hat administrators book better as it seemed more practical, as per the name I suppose. All the materials were great and had something unique to offer, I learned new things from all of them so it’s hard to just pick one video course or one book only to recommend for study. In regards to the books the RHCSA/RHCE study guide by Michael Jang seems to have a better rating on the Amazon website currently so that may be better if you only have time to just read one book. In addition to the above materials, I was also doing the RHCSA Rapid Track Course with Exam (RH200) which is a 4 day course with the exam on the 5th day, however I tend to over prepare and learn as much as possible as it helps me feel less nervous when it gets closer to taking the exam, in any case it beats failing and having to pay to take it again! The course was really great, if you can part with the money to take it and want to learn really quickly and already have some Linux experience I’d highly recommend it. If you don’t have Linux experience then the course is not for you, as implied by the name “Rapid Track” it’s a quick course to hit all of the key areas of the exam. If you don’t have very much or any Linux experience you’d be better off with the two courses Red Hat System Administration I (RH124) followed by Red Hat System Administration II with RHCSA Exam (RH135). Basically the Rapid Track course is the combination of both of these, from what was explained to me on the first day, so it depends on your current skill level. To help you know where you’re at you can complete the skills assessment test here which will ask you about 50 questions and based on the results suggest you a course. You also get to see the areas you are good and not so good at which helps you know where to focus your time towards improving. The course covered essentially everything that was in the exam. By the time I took the actual course though I’d gotten through most of the above material listed previously in my own time and I found some parts of the course a bit boring as I’d already gone over some areas so much already. This isn’t saying anything bad about the training, probably more that I didn’t need to study so much beforehand, or perhaps I should have done the course that included both RHCSA and RHCE exams instead. The EX200 exam is practical, you sit at a computer with Red Hat Enterprise Linux (RHEL) installed and have to complete a series of tasks. For this sort of exam the best way to practice is by doing, that’s not to say all of the videos and books listed previously are useless as I found them very useful, but actually installing the OS and doing the things yourself is probably the most important thing that you should look at doing. This is why I found the RH200 course so great, because the whole thing was basically a hands on lab where you have to work through things and complete various tasks. If you’re practicing on your own you can download the RHEL ISO and install it, I did this in a virtual machine for educational purposes. You can use the free trial and you don’t need a subscription to use it, this just means you will not get updates and support which should be fine for practicing. A great alternative is to look at using another distribution like CentOS. I’ve been using CentOS for about 3 years and it aims to be 100% binary compatible with RHEL which is the upstream provider. What’s great about CentOS is that it’s free, so you can download it and install it and all of the commands and tasks you would do in your practice would apply to RHEL. 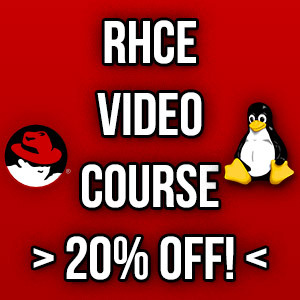 At some stage in the future I definitely want to look at completing the RHCE EX300 exam as that’s the logical next step and I don’t think I would need too much additional study, I don’t think I’ll do a Red Hat course this time around mainly as it would cost about $5,000 AUD for the RH300 course which seems to come with both the RHCSA and RHCE exams while I only need just one of those. Looking back I probably would have been better off doing that course from the start and completing both exams together so I may have underestimated my skills when selecting one to do. I’m not sure if I’ll get back into doing the CCNA first which I put on hold to start the RHCSA and then do RHCE, or do RHCE first – you’ll find out which I complete in a future post no doubt. The RHCSA certification is valid for 3 years, but if you earn the RHCE then that extends it so that it’s 3 years from that date, so the further off I leave that the longer my certification will last. The problem of course with that is, recently RHEL 7 release candidate came out so there will probably be certification for RHEL 7 soon and to get the RHCE with RHEL 7 it appears that I would have to do the RHCSA again with RHEL 7, so I might just look at doing the RHCE 6 first and then look at doing 7 some time far in the future. Once I have completed RHCE and CCNA I’ll probably look at going back into the Microsoft world and finishing my MCSE as mentioned in my previous post, the fun never stops. congratz for your achievement, can you please how much time a day and for how long it took you to prepare for the EX200 ? Cheers! Can’t recall exactly, it was 1-2 weeks for a few hours per day, though the training course itself was also 4 days of solid study. Congrats on your cert, and thanks for posting what materials you used. My question though, should I study for RHEL 6 or for 7? If 7 what materials do you think would be most helpful? Thanks! I think it would be worth while studying for RHEL 7 as I think the exams for 6 end around the end of 2014, though that may be incorrect. Congrats for this achievement. I will appear only RHCSA EX200 this weekend. I have a doubt, can i stop firwall in my exam machine? Thanks. You can disable it during the exam, however I believe that it needs to be running and that your solutions need to work with it running, so it’s best to learn how to use iptables. Congrats on passing the RHCSA exam. Since the exam is practical, what is the best practical software/book? I have a good understanding of RedHat but a lot of practical tests/situations would help me a lot. Thanks, personally for me it was just getting in and doing a lot of the tasks. I’d suggest reading through the list of required skills on the website for a particular exam, then get into a RHEL server and confirm that you can do everything required. Is this technology having scope for future? Definitely, Linux and especially RedHat based flavours such as CentOS are very popular operating systems. I am telling vmware 11 because Redhat 7 is not supporting in vmware 11.wat i will do?? Having any source?? Congratulation bro.received a score of 300/300 is really awesome. :razz: Awesome write-up.. my question is.. I want to study/practice on my own as I have experience with Linux already ( mostly Debian based) and just take the exam. I can’t find any individual places that just do the Exam. It looks like your forced to pay 400$ to take the course and then exam at the end. Thanks, glad it was useful! I’d suggest checking the RedHat website, you should be albe to sign up for only the exam, however it may depend on what is available in your area. You could try contacting RedHat sales for assistance, as the registrations for exams go through there. Good luck! Study hard! Also lots of practice, those are the two main things I can suggest. Make sure you actually set up a RedHat server and ensure you can do everything listed in the exam objectives and you should do well. Hi Mate, I will be taking the exam this week, just want to know if I should know how to bash script? will there be part of the exam that we will write a script? Hi Mate I appreciate your reply, however there are no scripting objectives listed, and I am sure I can perform all of those objectives already, well let me revise the question. do you think I should still go through scripting? If there are no objectives stating that you need to be able to perform scripting then it’s probably safe to assume that you don’t need to create scripts, however personally I think you should definitely still go through with it, as scripting is extremely useful for a Linux sys admin as it saves a lot of time. Here is my experience.This is for people who want to take the exam without paying for Redhat training. I have been taking exams for the last 6 years, you name it I have it. I have been preparing for the RHCSA for over 8 months, more than I did for CISCO CCNP! I received a score of 0.
during the exam, I rebooted the machine as many times as the exam questions to make sure all my configurations survived a reboot.I have been told that the exam scores will take up to 5 business days. Guess what? I had the score in less than 12hrs!!! Over the years, I learned how to read between the lines when it comes to taking a professional exam. make sure the exam correction is transparent. Redhat does not have an automatic scoring system, they still run manual? How did I know?I will let you figure when you take the exam without paying for the training. I did some research about people who passed the exams one think they all have in common is they all took Redhat training which means they all payed a contribution share. Add this, when I called Redhat few months ago to register for the exam, the lady over the phone asked me twice if I wanted to take Redhat training although I told her I am a Linux professional for years! I red Michael Jung books and all the available online resources for months including Certdepot (great website man, I love it) and instantly learned to reboot after every configuration. Not trying to spread any negativity around here, but if you planing on taking the exam without paying for the training, let me know how you passed because I wish I am wrong. One last think, the questions in the exam are not technically challenging, if you are a Linux user, you can finish them in 1hr to 1hr and 20 min! very basic for Linux professional. I passed the RHCSA exam without taking the training courses. Good work, yes definitely possible to study yourself some of the books that I have mentioned are really good. Hi there, yes that’s right it was the EX200 exam on the 5th day. As for RHCSA, I never took a single training course, but passed the exam with 300/300. Took me around 80 minutes to complete it – child’s play for any seasoned Linux admin. Tomas has his own series of posts on the RHCE as well which you might find useful over at https://www.lisenet.com/rhce/ – good luck! Thanks Jarrod. There are some posts that cover RHCSA as well, mainly LDAP/automount related. No, it’s not required and is completely optional, however with that said, I’ve taken the training and it’s definitely quite good. If you are capable of learning yourself from online resources such as books and videos then you can do that instead of the course. i am doing job in non IT but my qualification is in IT. i want to do career in IT with my interest which is in LINUX. i decide that i have to go with RedHat certification. Please Please can you help me and guide how should i start? take training. but i have to do this certification with some savings. Read through all the posts this page links to :) I cover most of the RHCSA objectives which will teach you lots. thanks Jarrod for your instance reply. can you tell how to do self study for this certification. study material and all i am talking about? You can see the list of objectives provided by Red Hat, just make sure you are able to demonstrate how to do each of those in Red Hat / CentOS Linux. Reading the official documentation is useful, otherwise as mentioned I have a lot of posts explaining what each objective means here. I believe it’s 210/300, although no one really knows how much each question is weighted, so knowing that isn’t too useful.